We know he is older than cheerios but I am pleased that the divide between McCain and the young rethugs is wider that I had thought it would be. (CNN) -- From cyberspace to college campuses, many young conservatives are worried that Sen. John McCain is not appealing to their generation. Eric Perlmutter, a Republican and student at the at the University of Southern California, said the roaring enthusiasm that follows Obama is missing among conservatives his age. "We try to get people out to our college Republican meetings, but ... we can't seem to draw the same kind of vocal support," he said. 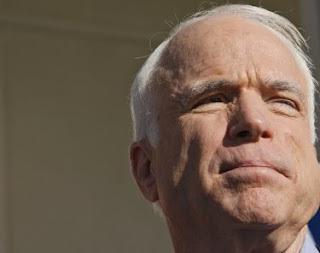 On MySpace, Obama has more than 427,000 friends, compared with fewer than 60,000 for McCain. With the increased interest this year, and the dramatic rise in young registered voters this is a big deal. A few trips to The Daily Show are not going to fix this. It seems that the McCain comment about not using email has also made a lot of young conservatives quite concerned. And frankly, they should be.